Just because you're an adult doesn't mean you have to act like one. 1. Serve a dessert grilled cheese. Your kids won't be mad at you for pranking them when they realize they now get to eat poundcake and frosting. Learn how here. 2. A mashed potato sundae also makes for quite the surprise. Act like the coolest parent ever and tell your kids you'll be serving sundaes for dinner, that way when they realize their sundae is actually mashed potatoes and gravy, it can be their dinner. Learn more here. 3. Confuse your kid on the ride to school. 4. Freeze your kid's morning cereal. Put a bowl of your kid's favorite cereal and milk in the freezer overnight, then watch in the morning as your unsuspecting kid clanks a spoon against the frozen milk. 5. Stuff toilet paper into the toe of your kid's shoes. 6. Affix a party popper to your kid's bedroom door. The best part of this prank? It will wake your sleepy kid up...and fast. 7. Sew one of your kid's socks closed halfway down. If you're the sewing type this prank will leave you in stitches. 8. Put a "For Sale" sign in your front yard. Want to take this prank to the next level? When your kid asks where you're moving to say, "Alaska." 9. Make your kid think the principal called. Use your best acting skills as you tell your worried kid the principal's laundry list of complaints. 10. Cover the remote sensor with a piece of tape. Try not to laugh as your kid tries over and over to turn on the TV. 11. Block the spout of your kid's shampoo bottle. 12. Put a twist on a sunny-side-up egg. A halved peach in yogurt not only looks like an egg, but also makes a delicious breakfast. 13. Switch the bags inside two boxes of cereal. This is especially funny if you switch your kid's sweet cereal with dad's bran flakes. 14. Squeeze a few drops of dye into the bottom of your kid's bowl, then cover it with cereal. When your kid pours the milk it will change colors as it rises to the top. 15. Put a few dye pellets under the cap of your faucet. Unscrew the cap to the faucet, put a pellet from an Easter egg kit under it, then screw the cap back on. This will make colored water come out of the faucet. 16. Stick googly eyes on the food in your refrigerator. 17. Change the settings on your kid's mouse or trackpad. In your computer's settings you can make it so that the cursor goes in the opposite direction than it normally does. 18. Take a screencap of the desk top on your kid's iPad or computer and leave it up full screen. Your kid will be stumped why nothing happens when they touch or click on the icons. 19. Pack a surprising lunch. 20. Serve up a glass of juice that is really Jell-o. That first sip will be classic. 21. Tell your kids you've baked them a pan of brownies. Be sure to have your camera ready to catch the moment when your kid pulls back the tin foil to find brown Es instead of the expected chocolate goodness. 22. Paint a bar of soap with finger nail polish and leave it in the shower. The soap won't lather, which should give your kids fits as they try to get ready. 23. Stick a helium balloon in the toilet and close the lid. When your kid lifts the lid in the morning the balloon will float out and startle them. For extra fun you could even write "April Fools!" on it. 24. Tell your kid your bought them an iPad. "I'm sorry, sweetie, did I say iPad? I meant I bought you an eye pad." 25. Replace Cheetos with carrot slices. Open the bag from the bottom, swap the Cheetos for carrot slices, then glue it back together. Your kid shouldn't mind, after all, they're both orange, right? 26. When your kids are sleeping switch them into each other's bed. Waking up in their sibling's room is a hilarious way to start April Fools' Day. 27. Super glue a couple coins to the ground outside. 28. 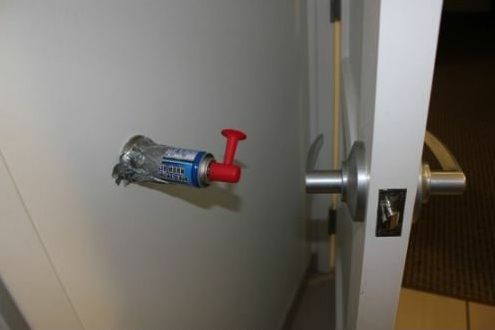 Tape an air horn to the wall next to the door. When the door handle hits the horn your kids will jump. You might too! 29. Make candied apples with onions. Your kids will find this one hilarious...in a decade or two. 30. Pick up your kids from school wearing a funny wig. When your kids asks about it tell them you went to the hairdresser while they were at school. 31. Lastly, if you're feeling really ambitious you can try this outrageous prank. Just don't expect help cleaning up the mess, especially not from your startled kids!